• Valentine’s Day viewing – Married At First Sight had to win, right? 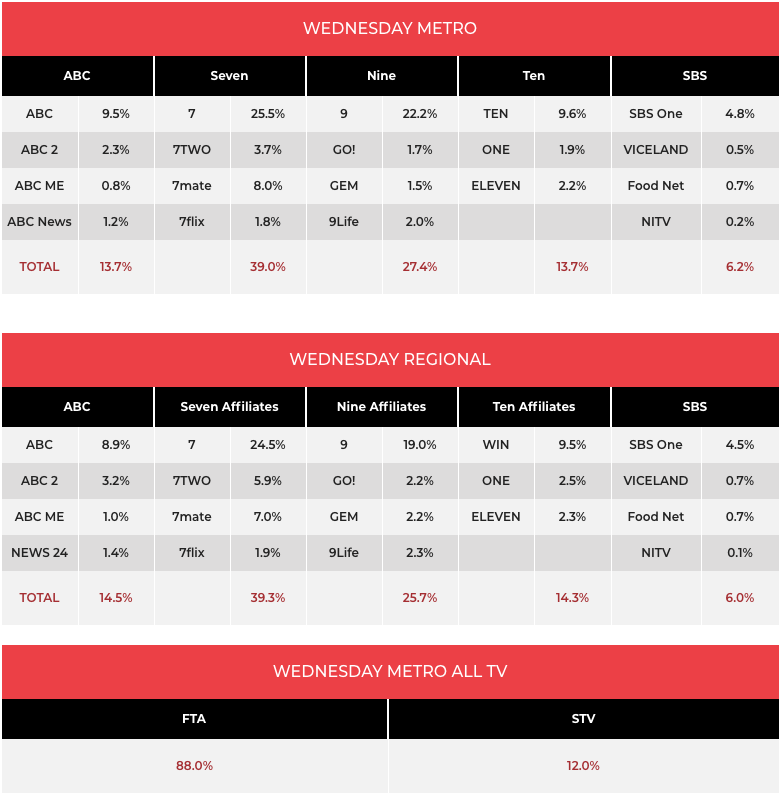 Combined channel share still close to 40% for Seven despite an easing in the numbers for My Kitchen Rules. Seven’s primary share was on top with 25.5% and, thanks to 8% for 7mate, Seven’s combined share was on 39.0%. Home and Away was down just 10,000 from Tuesday to 677,000. My Kitchen Rules saw Adelaide cricket tragics Dan and Gemma hoping for a century but they fell well short on 63 after a lemon pudding fail saw the judges give them two out of 20 for the third course. The show was under 1m, which is a very rare event. 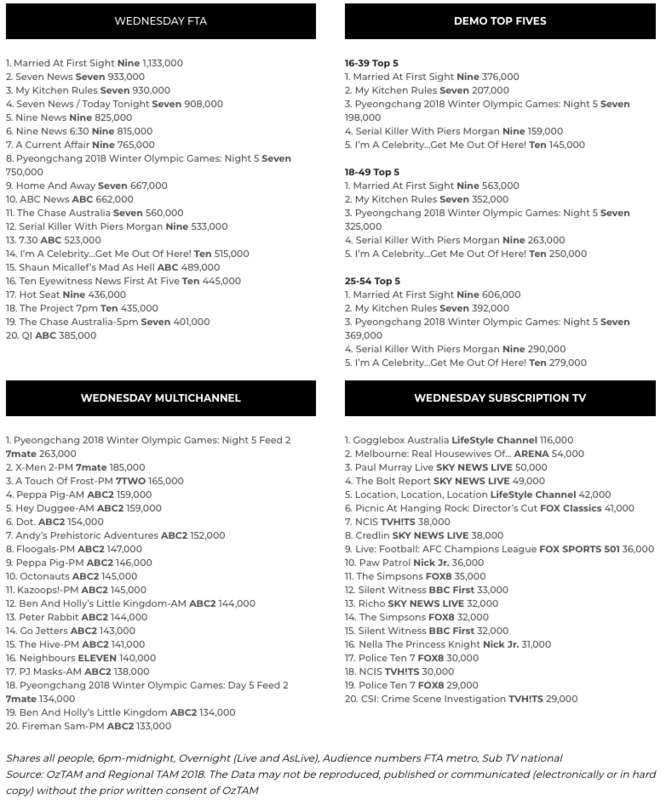 In fact the smaller crowd of 930,000 was the lowest metro audience ever for the series now in its ninth season. Night 5 of competition at the Winter Games then did 750,000, which was well down on previous evenings. A Current Affair was just over 750,000 for its midweek episode. 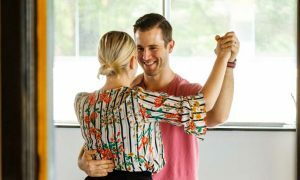 The Valentine’s Day episode of Married At First Sight again pushed over 1.13m giving it a clear win all people and again in the key demos. The new post-show Talking Married on 9Life did 128,000 metro last night. Nine turned to crime after 9pm with Serial Killer With Piers Morgan on 533,000 and then George Freeman’s Australian Crime Stories on 228,000. Like a few programs on the channel this week, The Project has been challenged in the first week of survey. After 7pm last night the episode was under 450,000. I’m A Celebrity…Get Me Out Of Here! remains the best for the channel at just over half a million. Just why The Good Doctor can regularly do over 1m yet others are well short of the mark continues to puzzle. No doubting that Doctor is a great program, but so is This Is Us. 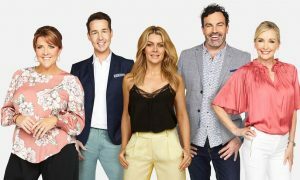 The drama returned to TEN last night with perhaps its most-anticipated episode so far, yet it did 250,000 after Celebrity. The final of QI, for now, did 385,000 at 8pm. Shaun Micallef’s Mad As Hell then built the ABC audience to 489,000. The second week of Squinters followed with 333,000 after 9pm. Adam Hills: The Last Leg then did 199,000. The World’s Greatest Bridges was on 253,000 and Simon Reeve’s Russia then did 244,000.